Even if you think your dentures are fine, you need them relined every three to five years to ensure a proper and healthy fit. Patrick Carbone, expert denturist and founder of Lilly Denture Center in Olympia, Washington, relines your dentures the same day of your scheduled appointment. If you live or work in the Olympia area and your dentures are ready to be relined, contact Patrick’s helpful and friendly staff by phone or email form. Why do I need to reline my dentures? Even though you’re not aware of it, as you age, your gums and jawbone shrink. If you’ve had your dentures for at least three to five years, relining them helps enhances their function, fit, and preserves your oral health. What if my dentures still fit? Small discrepancies in the fit of your dentures may not cause discomfort, but they could inhibit proper function. Patrick checks the fit of your dentures to ensure they’re still snug and creating a properly aligned bite. What are the advantages of relining dentures? How does a denturist reline my dentures? When Patrick relines your dentures, he performs one of two procedures. A hard reline involves re-coating the underside of your dentures with new acrylic, so they fit better. A soft reline involves coating the inside of your dentures with a rubbery, flexible resin that makes them softer, easier to tolerate, and enhances their fit. For a hard relining, Patrick first scrapes away some of the acrylic on the underside of your base. He then coats that with a rubbery material and re-inserts the denture into your mouth. When he removes it, he has an impression of the current state and position of your gums and alveolar bone. Because Patrick’s lab is on the premises of Lilly Denture Center, he can quickly and expertly use the impression he made to create a new acrylic layer that’s affixed to your denture. Your relined denture perfectly fits your current mouth, gum, and bone shape. In some cases, he may need to create a new acrylic base, into which he inserts the teeth from your old dentures. How long does relining dentures take? Patrick relines dentures in his state-of-the-art dental lab at Lilly Denture Center the same day you bring them in for repair. As long as you’ve made an appointment, you can have your relined dentures back within hours. If you’ve had your dentures for a few years or noticed them slipping or feeling loose, get them relined at Lilly Denture Center. 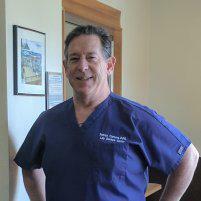 Contact expert denturist Patrick Carbone by calling his staff or booking an appointment online.